One useful fact about rose bushes is that you can grow a new one from a cutting of an old bush. Reproduce your roses inexpensively with help from a professional horticulturist in this free video. Hi, I'm Stan DeFreitas, Mr. Green Thumb, for askmrgreenthumb.com. How do you take a rose cutting and start a new rose bush from it? 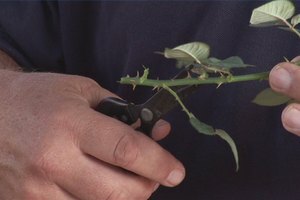 Well, we are constantly trimming roses all the time, so if you take a cutting like we have here, you're typically going to cut the base at about a 45 degree angle. It gives you more area for roots. I normally would take off some of the foliage, because you can't hold too much foliage on there, and when you do, kind of trim off some of the stems, the little stickers. I'm going to take a product like the rooting hormone, or the Rutone, and this rooting material is indolebutyric acid. Take your cutting, dip it into this powder, and then shake it on the side because you only need a small amount of this rooting hormone, or indolebutyric acid on there. 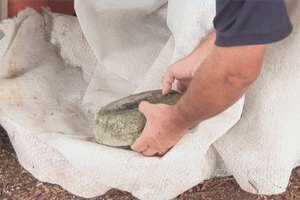 We're going to take this, we're going to stick it in to the good potting soil, typically a good peaty-type soil, maybe some black cow cow manure, maybe some peat Perlite, and when you do that, you should have good results. We're going to stick it down in the soil and keep it moist, and it should grow and give you another plant. Typically, I'd leave it in a good potting soil for the rest of its life. For learning more about how to do cuttings, and for askmrgreenthumb.com, I'm Stan DeFreitas.